Tyne Cot marks the furthest point reached by Commonwealth troops until nearly the end of the war. The Tyne Cot cemetery (of which the memorial forms one boundary) surrounds a large captured German pill-box used as an advanced dressing station, upon which the Cross of Sacrifice is placed (at the suggestion of King George V on his visit in 1922). There are three other pill-boxes in the cemetery. 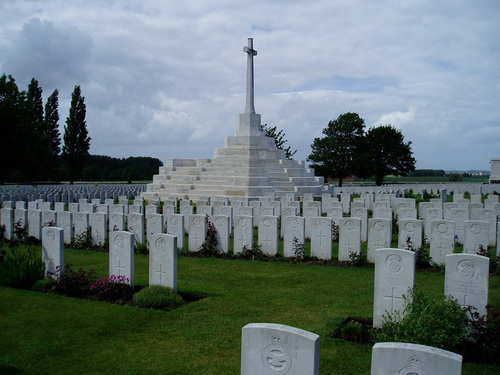 The original battlefield cemetery of 343 graves was greatly enlarged after the Armistice when remains were brought in from the battlefields of Passchendaele and Langemarck, and from a few smaller burial grounds. It is now the largest Commonwealth war cemetery in the world in terms of burials. There are now 11,956 Commonwealth servicemen of the First World War buried or commemorated in Tyne Cot Cemetery. 8,369 of the burials are unidentified but there are special memorials to more than 80 casualties known or believed to be buried among them. Other special memorials commemorate 20 casualties whose graves were destroyed by shell fire.